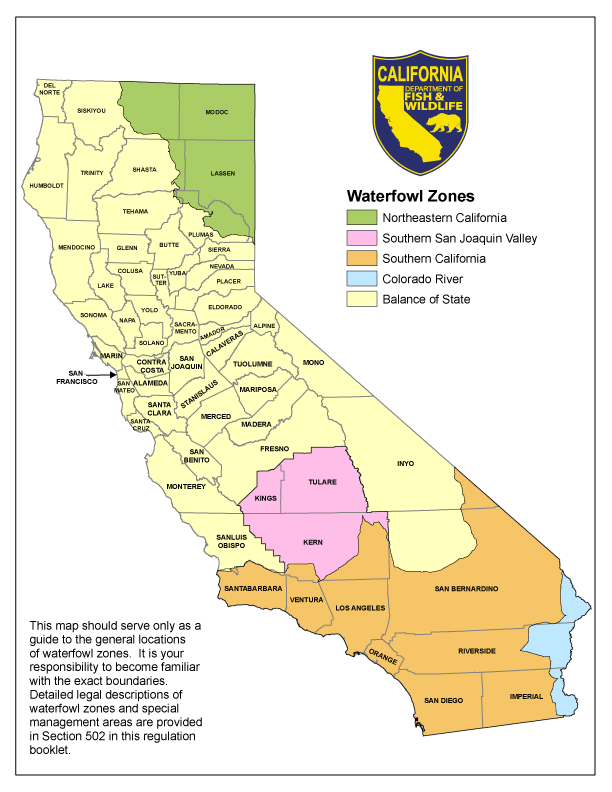 As California’s 2015-2016 waterfowl hunting season approaches, hunters may find that wildlife areas may have limited space, particularly early in the season. Most years, quality public hunting access can be found on more than two dozen national wildlife refuges and wildlife areas managed by the California Department of Fish and Wildlife (CDFW). With the ongoing drought, some areas will have significantly reduced amounts of water available while others will have normal to near normal water conditions. Some wildlife areas and refuges may be closed, while others may open later in the season or have a reduced hunter quota. State-operated waterfowl hunting areas that will be affected for the opener include Sutter National Wildlife Refuge and Kern National Wildlife Refuge, both of which will likely open late in the season. Opening and closing dates vary by zone. This information is included in the 2015-2016 Waterfowl Regulations booklet. CDFW is striving to only offer reservation applications for areas that will be open for hunting. However, last-minute closures may occur due to uncertain water availability and refunds cannot be issued for applications submitted to areas that close due to a lack of water. Waterfowl hunters should keep informed about current reservation and quota numbers, which are expected to fluctuate frequently. Hunters can also follow the Twitter tag #cawildlifeareaclosures for updates on state-operated wildlife area closures. In an ongoing effort to expand public access, CDFW is offering waterfowl hunting opportunities through the Shared Habitat Alliance for Recreational Enhancement Program (SHARE) at the Merced Wildlife Management Area in Merced County. For a description of the hunts offered and application instructions, please visit CDFW’s SHARE webpage. State representatives will recognize landowners, grape growers, agencies and environmental groups for their part in the development of voluntary programs to save water and protect local fish species in the Russian River watershed during the drought. The recognition will take place at a press conference on Friday, Oct. 2 at the Kendall-Jackson Wine Estate & Gardens in Santa Rosa. Voluntary agreements were developed in partnership with the California Department of Fish and Wildlife (CDFW) and the National Marine Fisheries Service to provide water to protect coho salmon. Some agreements detail water conservation efforts and others outline flow releases during critical times for the migrating fish. There are currently 41 Voluntary Drought Initiative agreements signed with vineyard and rural landowners within the Russian River watershed. In mid-June the State Water Resources Control Board adopted an Enhanced Conservation Regulation requiring all users in critical stretches of Mark West, Green Valley, Dutch Bill and Mill creeks – which flow to the Russian River — to reduce water use wherever possible, especially on lawns and ornamental landscapes. The requirement also prohibited certain discretionary uses of potable and non-potable water in commercial agriculture. Following that mandate, a group of grape growers worked with CDFW to develop the additional Voluntary Drought Initiative that, in conjunction with farmers in the critical stretches of the four creeks, aims to reduce water use by 25 percent. They also developed a reporting program that will track their progress toward that goal. In one agreement, Jackson Family Wines will release 7.2 acre-feet of water from a vineyard reservoir into Green Valley Creek through December 2015. Water release agreements will improve conditions in that tributary, improving the odds of survival for juvenile coho spending the summer in the stream. In addition to the water release, Jackson Family Wines contributed $20,000 in seed money to assist Trout Unlimited in establishing a program for the purchase of residential tanks for rainwater collection. This program will help minimize the need for people living near the stream to draw upon it for water. This year juvenile coho salmon face the daunting challenge of surviving the fourth year of one of the most severe droughts in recorded California history. CDFW has asked landowners to participate in voluntary agreements to help ensure enough water remains in streams. Partnerships with landowners for habitat have been key to the state’s efforts to conserve fish and wildlife resources. For more information on Jackson Family Wines, please visit www.jacksonfamilywines.com. For more information on CDFW efforts to protect and preserve fish and wildlife through this drought, please visit www.wildlife.ca.gov/drought. To learn about all the actions the state has taken to manage our water system and cope with the impacts of the drought, visit drought.ca.gov. Conservation – the wise, sparing use of water – remains California’s most reliable drought management tool. Each individual act of conservation, such as letting the lawn go brown or replacing a washer in a faucet to stop a leak, makes a difference over time. With a fourth year of extreme drought conditions reducing the cold water supply available, the California Department of Fish and Wildlife (CDFW) is moving fish out of the San Joaquin Hatchery near Fresno for the first time. The water level at Millerton Lake, which supplies water for the hatchery, is so low that the temperature is not cold enough for the hatchery fish to survive. Workers have been evacuating the hatchery-raised rainbow trout, some of which are as large as 3 pounds, into lakes in Fresno , Kern, Tulare and Tuolumne counties for more than two weeks. The fish planting process should be completed within the next few days. 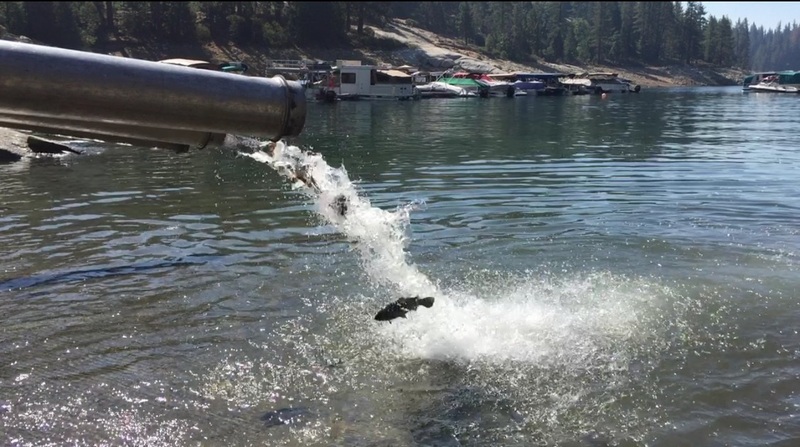 The fish have been planted in Shaver Lake, Huntington Lake, Courtright Reservoir, Wishon Reservoir, Pinecrest Lake, Kern River below Johnsondale Bridge and the Tule River at Camp Nelson. CDFW has been stocking rainbow and brown trout from other state hatcheries, including the American River Hatchery in Sacramento and Kern River Hatchery near Bakersfield, into state waters earlier than normal. Many of these are catchable-size trout, in addition to some fingerlings and smaller fish. By increasing planting frequency and the number of fish planted, CDFW can somewhat offset the natural decline in fishing opportunity as water temperatures in many geographic locations become unsuitable. The accelerated planting schedule will continue until the end of summer when all the fish in the raceways are expected to be evacuated. At the San Joaquin Hatchery, CDFW is moving next year’s inventory of small, fingerling-size trout to its Moccasin Hatchery for rearing until water temperatures at the San Joaquin Hatchery return to suitable levels. Fall and winter rains, if received in sufficient amounts, will cool water temperatures enough to allow hatcheries to come back online and resume operations. The grant application deadline for anadromous salmonid restoration projects that address impacts of the ongoing drought has been extended, due to the recent addition of a consultation requirement. Prior to submitting an application to the California Department of Fish and Wildlife (CDFW), all applicants must consult with representatives of the California Conservation Corps and California Association of Local Conservation Corps in order to determine the feasibility of Corps participation in the proposed project. Application guidelines and details about this requirement can be found on the Fisheries Restoration Grant webpage (www.dfg.ca.gov/fish/Administration/Grants/FRGP/Solicitation.asp). In order to allow time for applicants to comply with this additional requirement, the application deadline has been extended to July 31, 2015. All applications must be received by CDFW by 5 p.m. on this date (postmarks will not be accepted). Approximately $1.5 million in grant funding has been earmarked for habitat restoration, water conservation, education and drought planning projects located in anadromous waters within coastal watersheds and the Central Valley. Eligible applicants include public agencies, recognized tribes and qualified nonprofit organizations. For information or questions about the solicitation or application process, please contact Patty Forbes, Grant Program Coordinator, at (916) 327-8842, or Kevin Shaffer, Anadromous Program Manager, at (916) 327-8841.